There is nothing better than a cool refreshing drink on a hot summer day. This Mocha Frappé really hits the spot. It’s easy to make and absolutely delicious! Place all the above ingredients in a blender and blend until smooth. 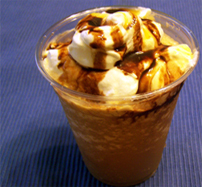 Pour into glasses and top with whipped cream and a drizzle of chocolate syrup. Serves 4. *TIP* You can lighten up this drink a little by using skim milk. If you do not drink caffeine, try using decaffeinated instant coffee. This is sooo good! It tastes refreshing and the skim milk is a great idea if you want lighter. We will use soymilk and it is awesome too. Yum!! !